Summer has at long last arrived. No more shoveling the driveway or sidewalk. Time to begin shoveling the interior of the house. 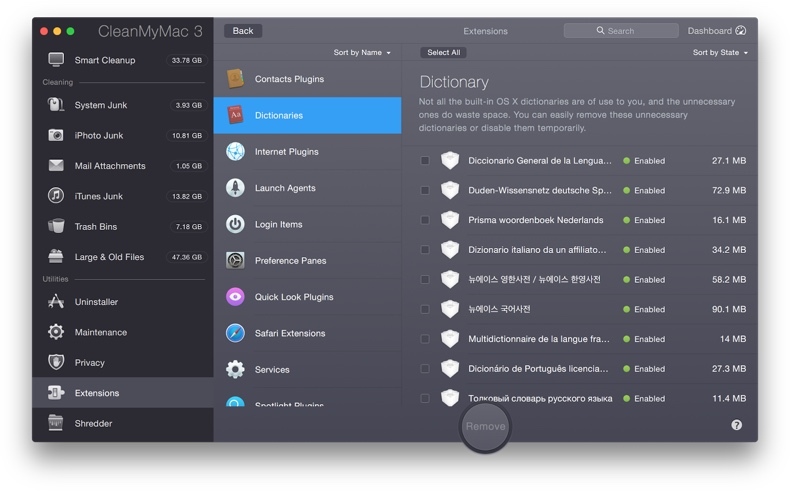 CleanMyMac 3 is the latest version of the well known cleaning app from Macpaws. It’s a one-stop shop. Maybe I should just return to the garage. But no, there’s no way around it. There’s junk on my Mac. So, it’s off to work. 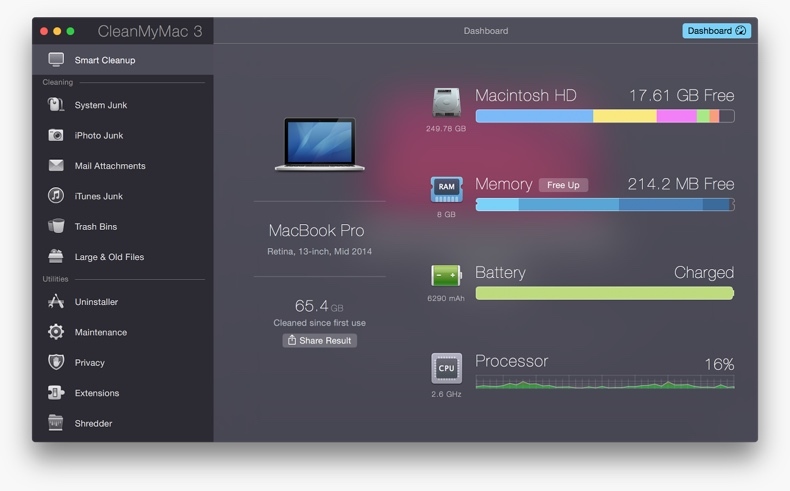 CleanMyMac 3 is broken up into three distinct services: Smart Cleanup, Cleaning and Utilities. In a hurry or have a fear that you just don’t know of every nook and cranny to be searched? Thanks to Smart Cleanup, all your Mac’s cleaning needs can be accomplished with the click of one single button. All you need to do is highlight “Smart Cleaning”, click “Scan” and then “Clean”. your iPhoto and iTunes libraries, the Mail app, your Library and various Mac trash bins. It will discover all of the old files you’ve forgotten about on your hard drive. It scans your folders to show you the files that haven’t been opened in a long time. In my instance, what surprised me the most was just HOW MANY duplicate files I had amassed. Of course there are back ups and such, but I found that some of my files had eight copies! Yes, eight! When finished, CCM3 then will tell you exactly how many bytes you can reclaim on your HDD or SSD. I began with the “Cleaning” section and was astounded at just how much cruft was simply lying about my electronic attic. For instance, I found iOS apps residing in iTunes that I had deleted from my iPhone years ago. But there they were still there, using up precious space on my drive. Are you aware that there are hidden copies of your original photos in your iPhoto library? That’s because anytime you edit or rotate a photo, iPhoto creates a duplicate of the original and stores it for safe keeping. Every attachment you receive in Mail, such as PDFs and such, gets saved. And iTunes stores gigabytes of files other than your music, including outdated device backups, old software updates, broken downloads, and more. After completing cleaning, it was on to “Maintenance”. Again another surprise. As an example, the list of extensions that I had compiled seem to stretch a country mile. And if you really are into drilling down, “Maintenance” will present you with subsections of the subsections. If you haven’t kept your Mac up to snuff, you could easily spend an entire weekend getting your house in order. And you could dispose of several apps that CMM3 will replace the function of. Such as an app uninstaller. You can drag that now app to the trash, but still be left with tons of leftover pieces. Uninstall them with CMM3. You can optimize your Mac by reindexing Spotlight to improve its performance, repair disk permissions, speed up the search function in Mail, to mention but a few. There’s also a Shredder included. If you have confidential files that you would like to get rid of, merely drag them to the Shredder (should you be mistaken, they can actually still be recovered). If you really want to delete them permanently, CMM3. will erase them entirely, including their digital footprints. You will be notified of important changes on your Mac, and helped with any problems that should present themselves. From your Trash is getting full or an app stops responding, you’ll be notified and assisted with setting things right. CMM3 also serves as a monitoring app. You can track memory use, low SSD life, high disk temperature, processor and memory usage, battery charge cycles, and even let you free up RAM to reduce lag time on your Mac. BONUS: If there’s something that requires your attention, CMM3 will tell you what’s happening and how to set things right. To make things as simple as possible, there’s a MenuBar icon for instant access. As for support, CMM3’s website has FAQs, a knowledge base, license retrieval, a forum and contact support. As we digitize more and more of our media, and our transactions take place ever increasingly electronically, you end up with lots of valuable items to store. But along with those items comes a bit of flotsam. And that needs to be taken care of on a regular basis. I think that you’ll find CMM3 is a powerful and easy tool to use for the job. Plus you may be able to toss a few utilities to free up even more space. But make sure that you do it before next winter, please. This entry was posted on Monday, July 6th, 2015 at 5:33 pm	and tagged with Apple, Frank Petrie, Mac software, Review, reviews, software, Utilities, video software, YMPNow and posted in Reviews. You can follow any responses to this entry through the RSS 2.0 feed. « Freshly Squeezed Reviews: Play Ball!